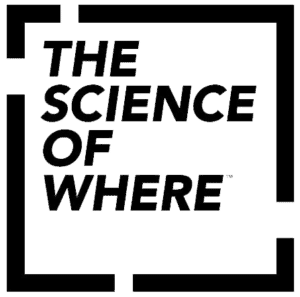 Who knows ArcGIS Online knows that it is a very powerful platform for visualizing location-based data. Less well known is that ArcGIS Online also offers a wonderful tool for telling and sharing stories about your data, Story Maps. ArcGIS Online Story Maps allows everyone to easily create, without programming, beautiful interactive web pages that tell your story. Are you not familiar with Story Maps yet? Be sure to check out the Story Map Gallery to discover the possibilities and be inspired! You can filter and search the gallery to discover how authors like you have told stories that might be similar to what you want to tell. Get a feel for what makes a good story. Borrow what you think works well, or think of your own ideas! 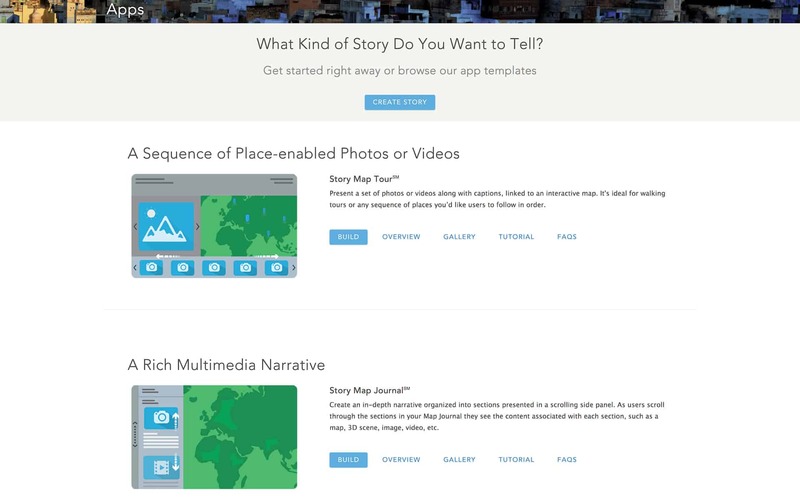 Go to the Story Maps Apps page to browse through the available templates and choose the best template for your project. With each template you can offer a specific viewing experience to your audience. There are templates for travelling around the map, interesting places, profound stories, presenting multiple maps and more. Spend some time comparing the templates, the layout options they offer and the different components that you can include in your story. If you have explored the Story Maps Gallery, you may already know which app template suits you best. If not, there is a wizard on the Apps page with the ‘Ask it the pros’ function that can lead you to the best app template for your story. Click on the ‘Build’ button in the app template of your choice to start an intuitive, interactive storybuilder. Our Story Builders make it easy to write your story. There is no need to program. 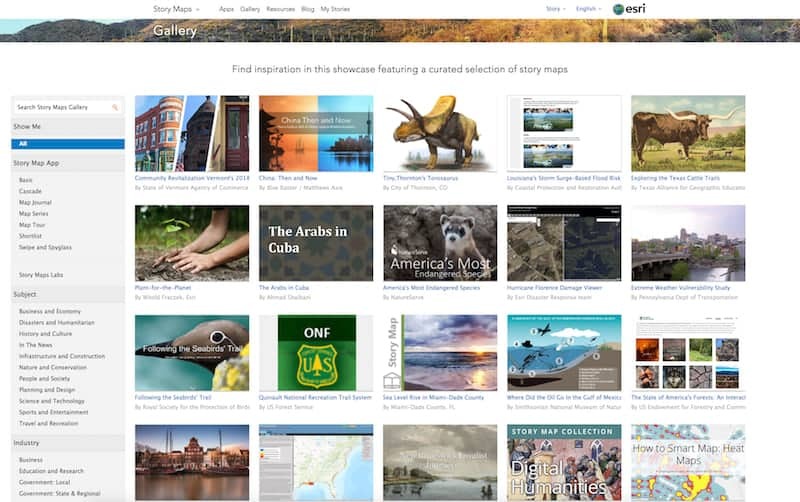 Story Maps are part of ArcGIS Online, Esri’s cloud-based mapping and GIS platform. You must therefore first log in with your (free) ArcGIS Online account to create your story. Your Story Maps, together with the maps and data they use, are safely hosted in ArcGIS Online. You do not have to download or install anything. If you need help, each app template has a tutorial page that guides you through the process. For more help, visit the Resources for Story Maps page. Do you have a question? View our FAQ page . As part of ArcGIS, Esri Story Maps gives you the full power of the world’s leading map and GIS platform to make your maps. You can collect and compose your own data, use available data in your organization and / or choose from the enormous collection ready-to-use, high-quality data provided by Esri and many other leading partners through the ArcGIS Living Atlas . ArcMap, Esri’s desktop products for GIS professionals. You can first create your maps in ArcGIS Online and then consult them when composing your Story. Some of the app templates provide the ability to create and edit your maps from their interactive builders (build button) so you can create your maps as part of building your story. In addition, the two ‘location-based’ app templates, the Story Map Tour and the Story Map Shortlist, automatically generate a web folder for you when you load your places. Now that you have completed your Story Map, you can easily share it with your audience. You can publicly share or restrict your story overview, so that it is only accessible to people within your organization. Go ahead and promote your Story Map for your audience. Link to it or publish on your website. Write a blog post about it, share it on social media, and so on.